What if WordPress provide us to make a nice looking resume WordPress theme with awesome features? Yes, they all set with WordPress along with stunning functionalities. We have done a deep analysis of resume WordPress theme and how to select your Best Vcard & Resume WordPress theme for your suitability. The first and most important steps to find and applying for a quality job is to have an accurate resume with qualification, as you know your achievement and qualifications are great way showcase your talent in extraordinary level. There are many themes available for making resume WordPress website with informative features. But there are some themes which can use to build a favorite website. In order to list down your qualification and experience with the acceptable manner it is good to have a website or a portfolio, nowadays WordPress providing countless resume WordPress theme with tons of features as shown below. We hope you will select a suitable theme for your purpose with your selection from below list. 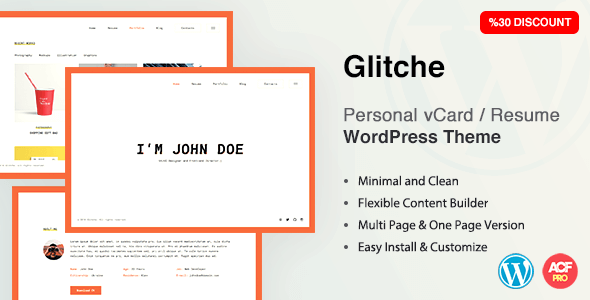 Glitche is a professional WordPress theme specially design for online vCard & resume WordPress website with essential features. The fully responsive theme that can be easily accessed from devices including mobile, desktop and tablet with high-quality resolution and user-friendly design. It has premium layouts builder with drag and drops features to make your own page under minimal requirements. Additionally, select a single or multi page layout from the package with 3 background variants. Glitche also fully customizable theme that you make any modification without any technical requirements. One click demo installer allows to make your website just under one minute, there you will be ready to launch. A number of widgets and short-codes to increase the website features and functionalities with nicely located places. Greatly support for integrate WPML plugin to translate your website into a multilingual site. Feel free contact the technical team of Glitche if there any doubts or question regarding the theme. Mee is a clean and responsive WordPress theme for making a beautiful resume and CV website in a professional way. Its offer visual composer page builder plugin to make your own page just with drag and drop features without any coding knowledge. As well as provides powerful admin theme option to make control your theme that allows making and customization and edit easily. Place your personal story and showcase the portfolio to increase the resume quality with MEE theme. Meanwhile, list down the skills in beautiful pie charts. Nicely used and handle icons and over 600 google fonts to give optimized content for your website. All the pages and contents are ready for rank on google with friendly articles. As well as good document and dedicated support for real buyers. MEE also having a feature to import demo content to your domain under one minute to make your website in one click, Cool. 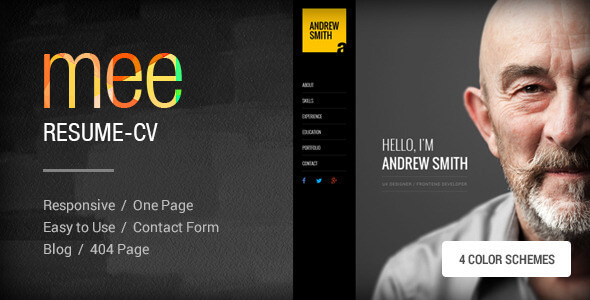 Such a great theme specifically designed for creative portfolio and resume CV website with an exactly nice feature list. It has one page and multi-page Creative portfolio & resumes CV WordPress theme layouts that can be applied for the designer, developer, freelancer, photographer, and other personal use. Me also allows to create your custom page with drag and drop features along with Visual composer page builder, as well as make use of pre-built homepages and portfolio layouts as per your requirements. Additionally, a number of the blog page that can lead your website usability and readability. 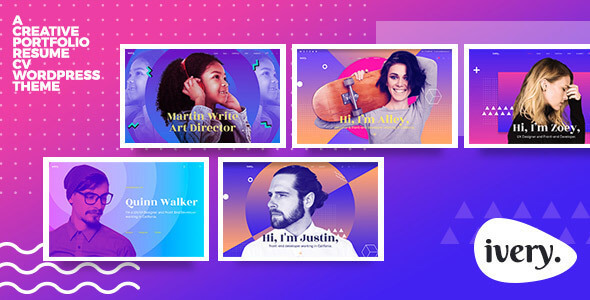 Make your homepage more stunning with slider revolution just by adding animation and effect to the pages slides. Me also offering features to import demo content to your website under one minute to launch your website with minimal requirements. WPML translate ready, make your website multilingual by integrating WPML Multi language plugin. And more features available for users. 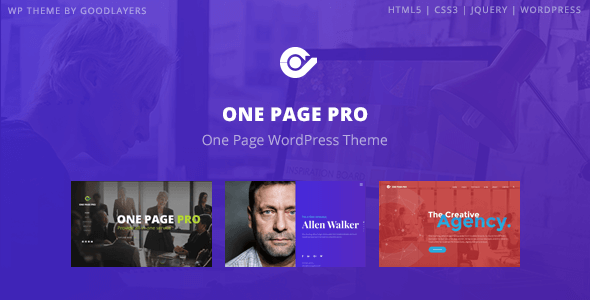 One page pro is clean and modern resume WordPress theme with a much better feature list and average buyer rating. Multi-purpose WordPress theme suitable for making financial, corporate website, designer, creative agency and professional CV and resume. Available three high-quality demos that you can check before start your development process. Where you can edit and customize with a powerful and live preview customizer. The complete package includes of Envato market plugin to receive the update where you can update the theme just with a single click. As well as unlimited sidebars that you can add a unique sidebar for each page and add multiple sidebars in a single page as well, with 14 blog layouts, 9 portfolio layouts with 11 hover styles and 6 galley layouts to showcase your latest and previous skills and experience. Awesome looking WordPress theme with dynamic features to create nice resume WordPress website with what exactly needs. Divergent is a single page WordPress theme applicable for making resume CV website for personal and company portfolio. 100% fully responsive theme with flexible built-in gallery plugin and touch screen friendly. As well Divergent also offering ECWID shopping cart solution to integrate your shop page with your website and making online money. Powerful theme options panel to edit and customize the theme as per your requirements with including color, elements, typography and much more. Compatible with WPML plugin to translate your website into multilingual. 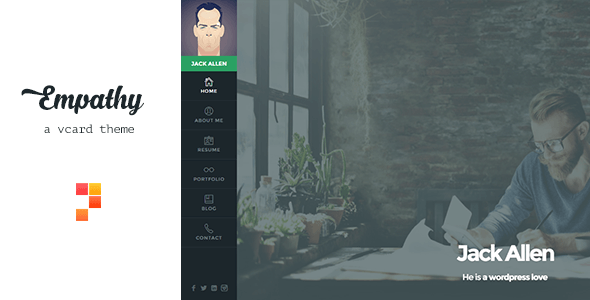 Creative portfolio, resume and CV WordPress theme. It’s a great choice for personal CV and resume website with amazing cool features. 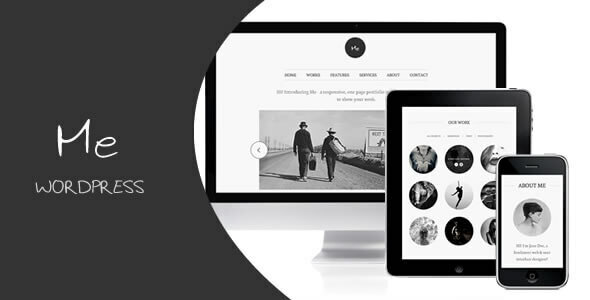 Moreover, a suitable theme for creativity, developer, freelancer, designer, and artist. Greatly support for visual composer page builder to make your own page or design your homepage just with drag and drop features with slider revolution plugin to integrate slides in your pages. Ivery also offering amazing 5 navigation layouts such as classic, center, left menu, dark and light style with sliding widgets. Multiple header layouts that you can select the suitable header for your website and make a change often to attract the new and exist users. Its uses Ajax technology to improve the performance of the website and readability. And 100% fully mobile responsive for all devices including mobile, tablet and desktops. 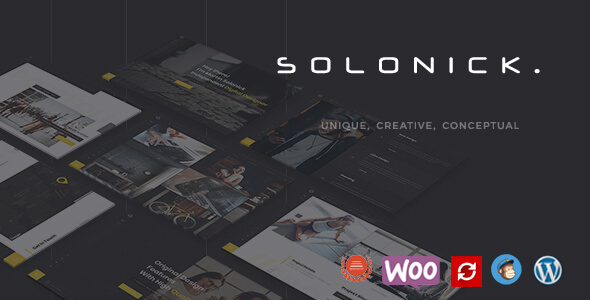 Solonick is a fully responsive and professional resume WordPress theme specifically designed for designers, musician, video producers, architects, photographers and more. Solonick has 9 different and unique homepage design with stunning features and functionalities, that includes half image, half slider, impulse image, full-screen image, full-screen slides, slideshow, full-screen carousel, video background, and slider revolution, meanwhile edit and customize the homepage styles with visual composer plugin, which is a great plugin for drag and drop page maker without any coding knowledge. 100& fully responsive that will look excellent on your desktop, mobile, and tablets with a stunning display, animation, and illustration. One page and the multi-page version available with unique features where you can get an experiment. Incredible parallax effects with full-screen background and video background with tons of shortcodes. Solonick having pre-built search engine optimization parameters to rank your website in google result pages. 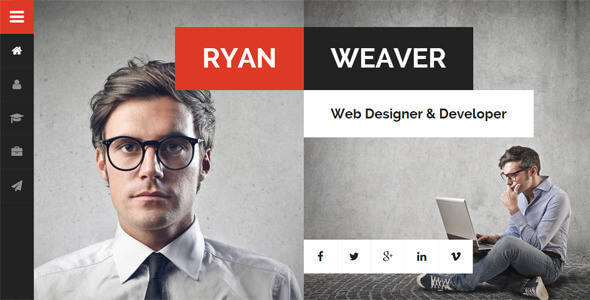 Simple and yet unique vCard WordPress theme with responsive and retina ready theme. It has unique and amazing layouts and design with plenty edit and customization options that you can make your stunning website within a minimum period of time with no hassle. All the contents are optimized and ready for access from any devices with a touch display and animated illustrations. Included portfolio to quickly filter the portfolio details and further skills just without reload the whole page with Ajax technology. Empathy also offers to compete for blog format such as photo, video, standard and much more. As well added custom widgets such as Instagram, Flicker, Pinterest, YouTube, Picasa, and more. Additionally, included WordPress theme customizer to modify the fonts, colors. Elements and typography. 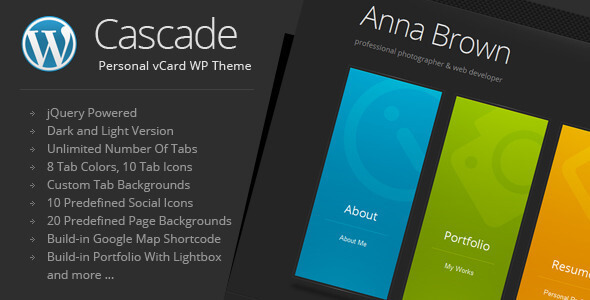 Cascade is minimalistic personal vCard WordPress theme based colorful vertical menu tabs with light and dark versions. 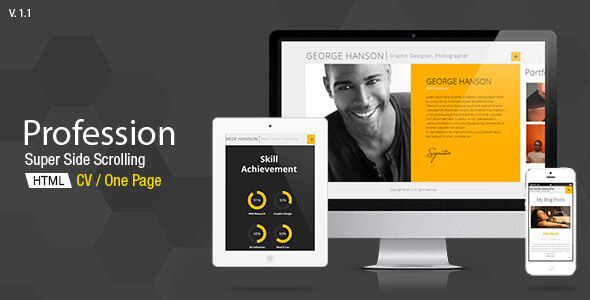 100% fully responsive resume WordPress theme with high-quality animation and touchscreen. Clean admin theme options panel to monetize your website with built-in lightbox, google map shortcodes, working contact form, latest tweet widgets and much more. Moreover, cascade offering fast and friendly support for all buyers and provides free lifetime updates with dedication. 8 unique and different tab colors where you can choose from the library to increase the website usability among all users. The number of shortcodes and widgets available with unlimited icons and google fonts. Profession is a super responsive resume and CV WordPress theme with unlimited features and functionalities. Profession offers the best way to implement an online resume that includes home, portfolio, resume section and contact selection. Powerful theme options panel with tons of built-in features to edit and customize it as per your requirements. In addition, awesome toggle menu to beautifully navigate the menu, modern vertical and horizontal scrolling to give a unique appearance to the viewers. Awesome short codes generator to increase the website optimization and much more. The profession also offering multiple post types that includes audio, video, images, quotes, galleries and much more.